The Leasingstede Museum, Feign valley, once again goes on tour and displays its “historical” artefacts. Now in Richmond, Jane Williams presents her second show The Lie of the Land. Those with curious minds can marvel at the treasures, from an original Root Master tool to a perfectly preserved Beaker. Jane has a wry sense of humour and finds enjoyment in playing with words and people’s expectations – all is not as it seems at her exhibition. The Leasingstede Museum was founded by Sir Erskin Nottrowe and for those who are unsure, this is a play on the words, not true. This whole concept is the imaginings of Jane. She has created a touring exhibition of “historical” artefacts all exhibited just as a museum would, on plinths, shelves and in cabinets with wonderful labelling incorporating a humorously detailed description of each item. Around the room you’ll find a history of the museum and its staff including the multi-talented, easily distracted, Hilda, whose job description ranges from Chief Curator to Specialist in Historical Woven Containers. But let’s not get confused between playfulness and hard work. One side of A4 writing took Jane hours. She painstakingly studied words and descriptions on a jaunt to the V&A then, with the inclusion of a couple of her own written trinkets, she jumbled them up to create an ordered explanation of objects within her exhibition. This is not just to confuse or be playful, the concept behind this touring museum gets us thinking about what an exhibition is, its artefacts, what value replicas hold and how we judge and receive them and their accompanying information. The Beaker is one of my favourites. A terracotta spherical(ish) container, looking a little like a bird house, is comprised of shards of clay with obvious gaps in its construction. It clearly looks like it’s been dropped and not so carefully reassembled. Yet, its description states it was, “Protected from damage.” And, “Most unusually, it was found intact and has not required restoration.” Jane’s enjoyment at devising a history for these objects is obvious and writes in such a serious manner that, once aware of her jokes, you read with a side smile waiting for the punch line. 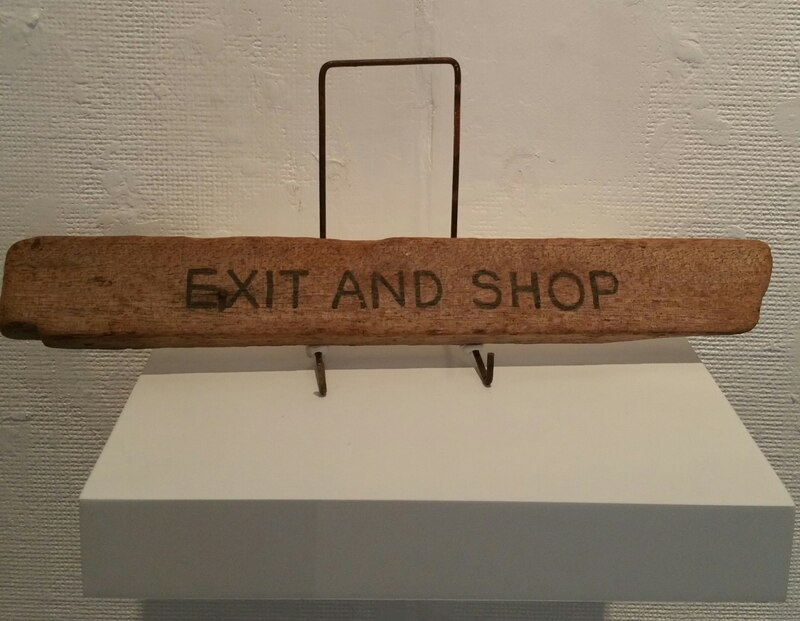 Her whole exhibition is written and displayed to confuse the unwitting and cause giggles among those in the know as they watch the nods of the heads and serious contemplations of an Exit and Shop sign. As Jane writes, “This is Leasingstede’s latest acquisition, after the Chairman of Trustees observed that all self-respecting museums have a version of this popular exhibit.” This light, humorous piece delves deeper into the essence of what is exhibited, preserved and how works are viewed. Jane’s touring museum can be enjoyed as a fun, light hearted show by both adults and children and if you so wish, you can dig a little deeper. You can consider how we, the public, view art and how we revere those “in the know”, you can question what art is? And of course, you can also discuss galleries and museums and debate what their role and importance is. This exhibition is more than a few chuckles and an admiration for play on words, it makes us think and question. It can also be enjoyed by people with a real interest in history as some objects are based on heraldry and numismatics. One piece which is very interesting in this way is a coin hoard. The coins were “found” by a Mr Trussel from Clipping Planchette. The names are taken from their relation to coins and their production. The gallery is open Mon – Sat. Check website for times. I found this exhibition both challenging and entertaining. It could warrant several visits and can be appreciated on many levels combiningJane’s considerable literary and artistic talents with endearing humour.